USS George H.W. Bush is the tenth and last ship in the NIMITZ class of nuclear powered aircraft carriers. 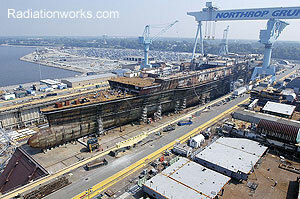 Currently under construction in Newport News, CVN-77 is expected to begin active duty in 2008. The naming of the George H.W. Bush was considered a political maneuver by a Republican controlled congress which departed from naming conventions by labeling numerous ships and monuments after living Republican presidents.